Forest edge, southern slopes of Mt. Kenya, Kimunye, Kenya, June 2017. 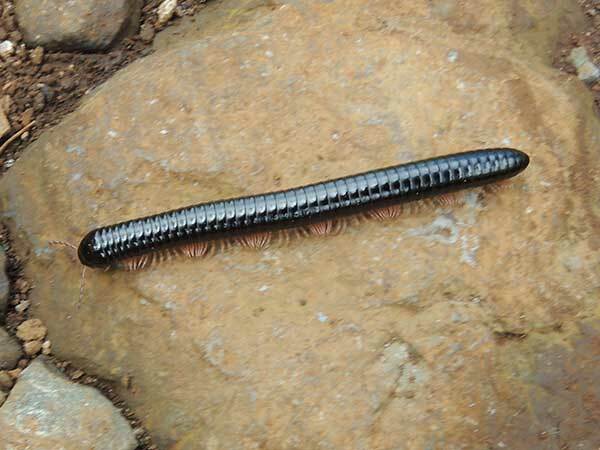 Millipedes are readily distinguished from other Myriapoda by virtue of their great number of legs and that there are two pairs to each segment of the body. Many millipedes can release toxic compounds when threatened or attacked. The glossy black color of this species might in this case be aposomatic. Copyright Michael J. Plagens. Page created 21 October 2017.